As a couple, my wife and I are quite enthusiastic about fitness, but very often because of the unpredictable and harsh weather, we are unable to venture to the park for an outdoor jog. Then we came across this stupendous product which was reasonably priced and was exceptionally easy to use. Merit Fitness 715T Plus is a robust machine with intuitive controls, large cushioned running deck, low-impact cardio, thumb pulse monitor and a powerful motor. It is just the ideal remedy to our indolent routine. Since, we are casual walkers, the attributes 715T Plus possesses perfectly fulfills our requirement, with the added pre-set programs proving very beneficial. It has minimal motor and belt noise with an attractive display console comprising of a 3-window LED display, which tracks your speed, distance, time as well as your resistance level. We have started relishing our workout sessions thanks to this endearing fitness tool. Even for those who love to exercise, jogging or running in the same park everyday can become really monotonous. Hence, we definitely felt the need of a gadget, which would allow us to achieve our fitness goals as well as distract our mind from the dull routine. This machine has solved the problem since the motor as well as the running belt creates minimal sound and therefore, creates no hindrance while we combine watching TV with walking. Further, the workout deck is completely foldable and is on wheels thus, it can comfortably be stored anywhere like in our case we keep it under our bed. Keeping in mind the cost of the treadmill, it is a seamless fitness tool for walking and light exercise. Our personal favorite features were the four pre-set programs and the aero-soft cushioning system. The pre-set programs include weight loss, intervals, rolling hills and manual. You can follow any of them according to your requirement. Moreover, the aero-soft cushioning system below the belt lessens the possibilities of shock that may occur to your feet and legs. We can change our incline levels without experiencing any interference or pressure on our joints which was actually a concern for both of us. Full marks to this basic treadmill model for its workout features. An influential powerful motor serves as the foundation for an impeccable treadmill. Merit Fitness 715T Plus owns a 1.50 Continuous-duty hp motor (2.50 THP) with one year warranty that provides a smooth and steady exercise session at any pace. It makes minimal noise and helps you to continue your fitness regime in a commanding fashion without being interrupted. 715T Plus is a non-sophisticated device, which can be easily handled even by a novel user just like us. We were a bit apprehensive in the beginning but gradually became comfortable with the machine. The display console is huge with heart-rate monitor, calorie counter and speed, distance and time tracker. Additionally, there is a water bottle holder on each side of the console which is very helpful. It offers a speed variation between 1 to 10 miles per hour in 0.5mph intervals, which is extremely good for a basic model. To add to this, assembling was an easy going task as it took just 45 minutes to compile the parts together. Imagine our joy when we were able to start our workout the very day we received the consignment! The Running belt of this Merit Fitness model is both long and broad enough to be absolutely comfortable. The deck measures 18 inches by 47 inches, which provides a large stride area. 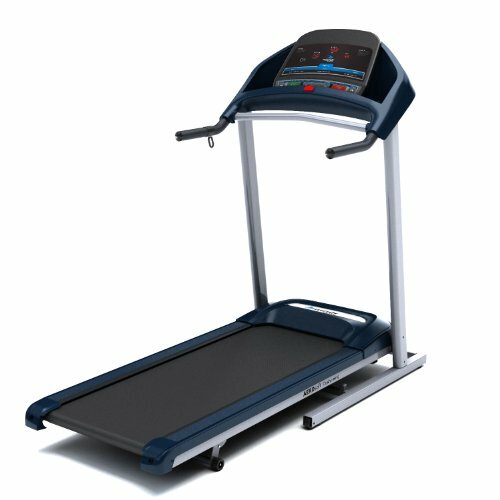 The Treadmill has a durable steel frame with a life-time warranty along with the Aero soft shock absorbing cushion system, which is another marvelous feature. It absorbs the pressure that may give a shock to your joint and feet thereby safeguarding you from any injuries even when you intensify your workout. The thumb pulse indicator and emergency stop feature for safety are valuable features present on the display console. The former helps you keep track of your heart rate and eliminate the guess work which one normally does. The incline is manual so it will affect your training session rhythm. But for the affordable price of the tool this tiny flaw can be ignored. A residential grade treadmill with decent characteristics. Adjustable speed from 0 to 10 MPH with 0.5 MPH intervals. Intuitive controls with 3- window LED display panel depicting your distance, speed, time, calories burnt and much more. 18 by 47 inch workout deck with Aero-soft cushioning system. Foldable frame with dimensions 29 x 52 x 61 inches for easy storage. 2.5 THP (1.5 CHP) drive powerful motor. Manual three positioned incline range from 0 to 5 %. Easy to use controls, four pre-set training programs, 3- window LED display and reasonable price. Maximum user capacity is only 250 pounds with manual incline control. Merit Fitness 715T Plus has proved to be a decisive choice for me and my wife. With all its fabulous features, it has abetted us to inculcate an exercise routine into our life. For aspiring walkers like us this immaculate machine is a blessing, which has helped us to enhance our output and achieve the fitness goal we dreamt of. We would love to recommend this machine to fitness-enthusiastic families with a limited budget!